Tauranga and Mount Maunganui are home to amazingly beautiful beaches, calm harbour waters and a dynamic cosmopolitan lifestyle. Tauranga and Mount Maunganui are excellent destinations for a day-trip while staying with us in Awakeri, at Awakeri Hot Springs’ Holiday Park. 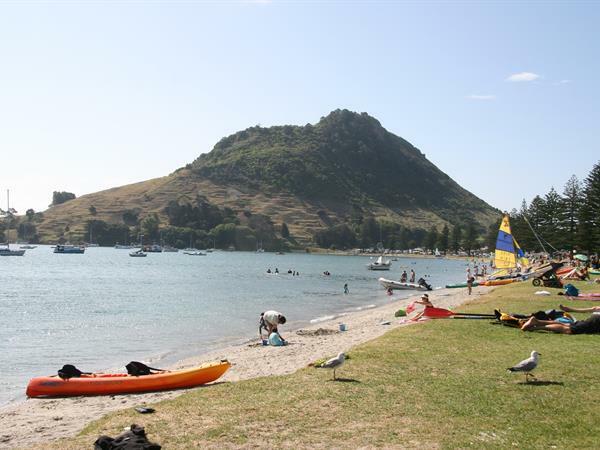 Enjoy the endless stretches of white sand and sparkling surf, walk around the base of the majestic Mount Maunganui for a sea-side picnic and go indoor rock climbing. Or head to The Strand in Tauranga, to browse through boutique stores and a melting pot of cafes, bars and restaurants of world-class standards. Immerse yourself in the world of kiwifruit at Kiwi360, spend an afternoon taking in the high-octane action at the Speedway, or take in a round of golf on one of the Bay of Plenty’s excellent golf courses. After a long day out, it’s just a short drive back to our Whakatane holiday park accommodation, to relax in our Awakeri Hot Pools – the most serene hot pools in the Bay of Plenty!